Gratefully, Simple Ways to Achieve Happiness - What do you most desire in life? Treasure? Spouse? Or perhaps a position in a job? However, if all of you agree that goal, summed up into a simple word, which is happiness? Satisfaction with what we achieve may be one of the things that affect happiness, but do not have to deal with what we get, it turns out happiness is also closely linked with the flavors can develop our own. Simple, just to be grateful or always grateful for what we have can be how to bring happiness. How is possible only with a grateful person can achieve happiness? Not just fictional, the facts on a wide range of research and resources that discuss happiness, most of the results of scientific studies stating one of the factors that most affect happiness is gratitude (grateful). One of the research evidence that corroborated the impact of gratitude toward happiness is revealed by the results of a research scientist at the University of California, which found that with gratitude, the level of happiness will increase to 25 percent, as well as the positive impact on health, even can also improve the quality of relationships with people other. Not only scientific study of gratitude can be a bridge to achieve happiness, even if we are more observant in fact, it turns out from the side of religion has mentioned that with gratitude, the happiness in life can be achieved, even almost all the beliefs that teach about gratitude. In connection with grateful benefits as a source of happiness, the evaluation of the self will be essential in order to build a sense of gratitude, which coupled with an understanding to promote the positive side of all the achievements that have been achieved. For example, not all the results we obtain in line with expectations and plans, and led to the failure, try to see it from the positive side, with the face of failure means that we are given the opportunity to learn and know the shortcomings of the effort to achieve the hopes and plans. 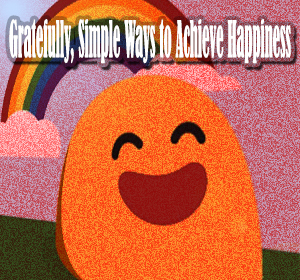 Well, says the brief information about grateful as a simple way to achieve happiness. Hopefully, this information can be an additional useful knowledge for you.